The most dominant figure in Wayne County League athletics in the mid-forties was Harry Weckesser. He lettered in three sports, football, basketball, and track, and was a stellar performer in all three. He set a Wayne County discus record in 1947 and was good enough in football to be awarded a scholarship to Syracuse University. Basketball, however, was where he had no equal. He held every Wayne County League scoring record upon graduation from Doylestown High School and later continued his proficiency at scoring at The College of Wooster. Weckesser gathered nine varsity letters at Doylestown, picking up two in track, three in football, and four as a hoopster. As mentioned, his best efforts were in the gym. His assault on the Wayne County League record book began in his junior year as he established a new league standard for points in a league season. He also broke the county record for scoring for all games in a season. He again set new marks in his senior year and added the Wayne County career scoring record to his other titles. He was M.V.P. for the Wayne County League as the Chipps won 53 games and lost only 7 during that span. Weckesser’s adeptness at playing spit end for the Chipps enabled him to win a full football scholarship to Syracuse University; however he returned to the county after one semester and enrolled at The College of Wooster. Although he never played any football for the Scots, he lettered in basketball for three seasons and captained the team in his final year. He led the team in scoring that season and set a new single game record with 17 field goals against Hope. He picked up All Ohio Conference honors that year, and bucketed enough points over three seasons to place him third on the C.O.W. career scoring list. His feats earned him admission to the C.O.W. Sports Hall of Fame. 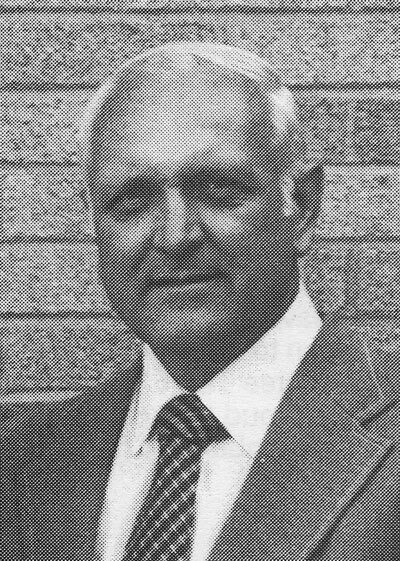 Following graduation, Harry became a biology teacher at Millersburg High School where he also coached football, basketball, baseball and track. He left the teaching profession to attend Ohio State University and in 1960 graduated with a degree in Dentistry. He set up his practice in Wooster and just recently retired from that profession. Today he assists his offspring in the operation of Pierce’s Sport Shop in Wooster, thus maintaining a tie with the local athletic scene.